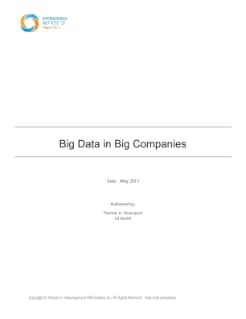 Analytics thought-leader Tom Davenport and Jill Dyché from SAS conducted an independent research study in early 2013 on Big Data Analytics Strategies for big companies. Their research (via multiple interviews) examined and described the big data analytics strategies of large SAS organizations that are early adopters of big data within their industries. During their 4 month study, Tom and Jill interviewed 20 companies which span across multiple industries.